One of the simplifications that lies at the heart of D&D5 is the Proficiency mechanic: one central value, derived from Character Level, added to your die roll. Whether you’re hitting stuff with a pointy stick or trying to remember the name of that ancient carbunculous statue: roll 1d20 and add Proficiency. So obviously, that’s RIPE for complication! Every character will now have five separate values to represent their relative skill in different areas. So, as a Barbarian you may favour Melee Combat, Saves and Skills; as a Wizard you’ll want to focus as much on Spell-casting; a Bard may go with a more even spread. All values start at +2. You get +1 to one Proficiency value of your choice at Level 1 and every level thereafter. You can’t add more than Level / 3 to any one value (rounded up to 1 for L2, with an absolute maximum of +8). This allows a generalist character to have +6 in all five areas by L20, or a specialist to have a spread of +8/+8/+8/+3/+3. A simple progression and easy to manage, but leads to over-powered specialists. All values start at +2. You get +1 to one Proficiency value of your choice at Level 1 and every level thereafter. The highest value must be within 2 points of the lowest value. This reduces the ability of a Specialist to run ahead, with a maximum spread of +7/+7/+7/+5/+5 at L20. However, it does allow someone to have +4 to one ability at 2nd level. Almost certainly not game breaking, but does stretch the underlying assumptions of the mechanics a little. Generalist: focusing equally on all Proficiency values, you get +1 to one Proficiency value every level (except 18th). At 10th level you have +4/+4/+4/+4/+3 and end up with +6/+6/+6/+5/+5 at 20th level. Dual specialist: 10th level is +5/+5/+2 and 20th level is +7/+7/+2. More granular, more choice, but complex book-keeping. And in reality, would anyone not go for something akin to Priority 3 or Focus 4? Might be better just defining some possible progressions at Level 1 and having players pick them. If you’re going to define Proficiency up front, why not just set it by class a la D&D3.x? E.g. A Fighter would be Strong Attack, Standard Save, Moderate Skill, Weak Magic. A Bard could be Standard Magic, Standard Skill, Moderate Attack, Moderate Save. Start with spread of +2/+2/+1/+1/+1. Maximum value of any Proficiency is 3 + Level /5 (rounded-down). Add one point to one Proficiency value as Method 1. At 5th level, a specialist could be +4/+3/+2/+1/+1. But by 20th level it’s evened out at +7/+6/+6/+6/+1. Why put this last, rather than as Method 1B? Well, because if I were to implement one of these ideas, this is the one I’d go with. 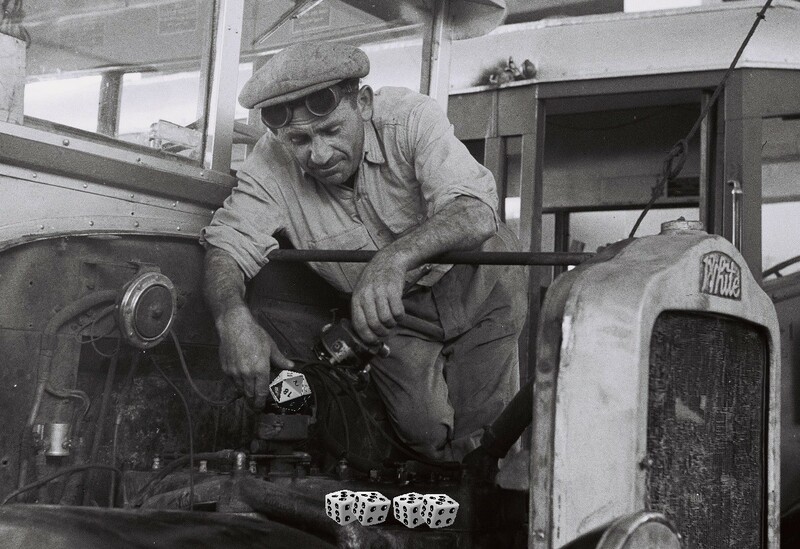 Balances customisability with simplicity. What’s not to like?! This entry was posted in House Rules, Mechanics and tagged D&D, D&D5, Dungeons & Dragons, Mechanics, Proficiency, RPG on December 23, 2015 by The Dice Mechanic. Great blog post on why Traveller isn’t hard sci-fi – and was never meant to be. 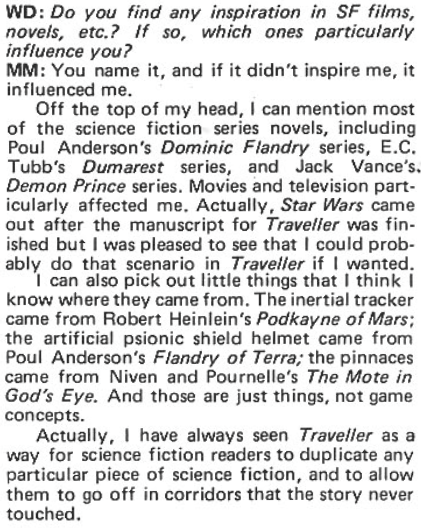 In an interview from 1981, Marc Miller suggests that the biggest influences for Traveller were numerous. Of note were SF series by Jack Vance, E.C. Tubes, and Poul Anderson. There’s no “right” way to play Traveller, nor is there any “correct” setting for Traveller. The short stories and novels Miller references would never make a coherent whole. Like Gygax referencing several dozen fantasy authors, there is no single coherent world to be built out of these tales. They are there for inspiration for the Referee to build his or her own setting for play. This entry was posted in Uncategorized on December 18, 2015 by The Dice Mechanic.